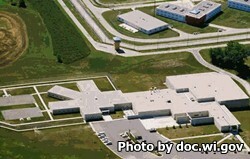 Sturtevant Transitional Facility is a medium/minimum security correctional facility that houses approximately 304 adult male offenders. The medium portion of the institution houses 152 inmates who are on either a probation or parole hold and are being processed through revocation and are likely to be transferred out to a higher security prison. These inmates are housed primarily in double occupancy cells. The minimum security portion of Sturtevant Transitional Facility houses approximately 152 offenders who are on either work release, participating in educational courses, anger management programming, or cognitive intervention. Offenders in work release must pass a risk assessment and are allowed to work in the surrounding community during the day and report back to the prison at the end of their shift. No visits will occur on the first Monday of the month due to institutional training. Visits for general population inmates occurs on Tuesdays and Thursdays from 6pm-8pm (processing ceases at 7:30pm) and on Saturdays, Sundays, and Holidays from 1pm-4pm (processing ceases at 3:30pm). All visits are limited to two hours in duration. Pobation/Parole Hold Unit has televisits only that occur on Mondays, Wednesdays and Fridays from 8am-11am/1pm-4pm, Tuesdays and Thursdays from 6pm-9pm and Saturdays, Sundays, and Holidays from 1pm-4:30pm. For more information read the Sturtevant Transitional Facility Visitors Guide here.